Gaza football fans have defied a Hamas order not to watch a match between Spanish giants Barcelona and Real Madrid. Hamas, which governs Gaza, is angry that an Israeli soldier attended the game. But thousands watched the 2-2 draw on TV. Jon Donnison explains why the fixture matters so much in Gaza. Barcelona Football Club arguably brings more joy to Palestinians than any other institution in the world. That's certainly my impression after almost three years in Gaza and the West Bank. Every time the Catalans take to the field you can guarantee you'll struggle to get a table in the bars of Ramallah and the shisha-infused coffee shops of Gaza City. On match day tradesmen touting maroon and gold Barca jerseys set up shop at Qalandia, the traffic-infested Israeli military checkpoint that separates Ramallah from East Jerusalem. I've lost track of the number of mini Messis I've seen dribbling their way around dusty backstreets. And if Messi senior and co manage to pull off a win, as of course they nearly always do, the night air is filled with the sound of car horns as supporters crane out of their sunroofs and parade round the streets. Of course, as the best team in the world in recent years, Barcelona FC has support across the globe. But Palestinians seem to have a particular affinity for the club. "We can identify with the Catalans and their struggle against the great power of Madrid, like the way we struggle against Israel," one supporter in Ramallah told me with a slightly far-fetched simile. I can't remember too many signs of military occupation the last time I was strolling down Las Ramblas. Of course there are a good number of Real Madrid fans here too but they're definitely outnumbered. You certainly don't meet too many people cheering for Manchester United, Arsenal or Chelsea, let alone my team Bolton Wanderers. It was with some surprise then that I learned that there were calls for Palestinians to boycott Barcelona FC and in particular this weekend's showdown with Real Madrid, El Clasico. If ever there was an institution that Palestinians might struggle to turn their backs on, I thought, it would be their beloved Barcelona. But this is a classic example of how there are few things untouched by politics in this part of the world. The controversy all started when Israeli government officials put in a request to Barcelona FC for a former Israeli soldier to be able to attend Sunday's game. Not just any soldier, though. Gilad Shalit is the young man who spent more than five years as a hostage in Gaza after being captured by Palestinian militants in 2006. He was eventually freed last year after the Islamist movement Hamas, which governs in Gaza, agreed a prisoner swap with Israel in which more than 1,000 Palestinian prisoners were handed over in exchange. Mr Shalit has kept a low profile since his release, with his parents asking for privacy to allow their son to re-adjust to life as a free man. The 26-year-old is a keen football fan and is believed to support Real Madrid. Israeli officials put in a request to Barcelona FC, asking whether Mr Shalit could attend the game at the Camp Nou stadium. But when the news hit the media, some Palestinian groups called for Barcelona to withdraw their invitation and threatened a boycott. Hamas officials in Gaza were quoted as saying Barcelona games would no longer be broadcast on television in the Palestinian coastal territory, without adding how they would go about stopping this from happening in practice. Barcelona FC realised they had opened something of a can of worms. Club officials quickly announced that it had also invited three Palestinian representatives to the game, including a Palestinian footballer who spent three years detained in an Israeli jail without ever being formally charged. Mahmoud Sarsak, who has played for the Palestine national side, was eventually released in July this year after having been on hunger strike - taking only water and vitamins - for three months in protest at his detention. Israel believes Sarsak is a member of the Palestinian militant group Islamic Jihad. Sarsak is a popular figure for Palestinians and Barcelona had hoped that by inviting him to counterbalance Shalit the club might be able to put an end to the controversy. Not so. Sarsak announced in Gaza that he would not be attending the match on principle. "I refuse to sit in the same place with a killer who came on a military tank," the former prisoner said, referring to Shalit. "I respect Barcelona's invitation, but I have to avoid angering the Palestinian people and their supporters as well as all those who supported me during my hunger strike." Sarsak added that he also respected those who believed he should attend the match in order to represent the suffering of Palestinians but said that after giving it a lot of thought he would boycott the game. Hamas has been keen to trumpet Sarsak's decision, although I suspect they may have plenty of now closeted Barcelona supporters among their ranks. It's worth noting that this row has also highlighted the ability of Hamas and their secular rivals Fatah, who are in power in parts of the West Bank, to disagree on just about anything. The two other Palestinians offered tickets by Barcelona were Jibril Rajoub, a leading Fatah figure and head of the Palestinian Football Federation and also the Fatah dominated Palestine Liberation Organisation's ambassador to Spain, Musa Amer Odeh. When contacted by the BBC on Thursday, Mr Rajoub confirmed he and Ambassador Odeh would not be following Mahmoud Sarsak's example and would be attending the game. Hamas is likely to try to make political hay. It's hard not to feel, though, that Hamas has scored something of an own goal here, if you'll pardon the pun. Most Barcelona fans I've spoken to here have appeared gobsmacked when I've suggested they might put political principles before El Clasico. "Are you kidding me?" has been the most common reaction. "I watch football and support Barcelona, because I see only sports, I don't see politics. 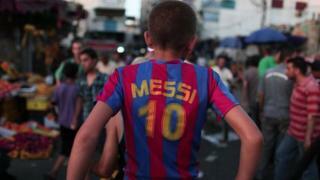 I won't allow for Israel to deny us from this fun time," says Nasser Ziad, a 25-year-old Barca fan in Gaza. "I was so sad and disappointed when they announced that the Israeli soldier Gilad Shalit will attend the Clasico but, personally speaking, I wish Sarsak had accepted the invitation to the match," he said. "I don't see it as a way of normalisation with Israel. It would have brought more attention to our cause." Thirty-year-old Ahmed Shafik agreed: "We should turn this into an Israeli-Palestinian Clasico. Sarsak should have gone to Camp Nou and used his presence for the good of our cause." I did not find any Barcelona fans in either Gaza or the West Bank who said they wouldn't be positioning themselves in front of a big screen on Sunday night. Most Palestinians probably don't remember Bill Shankly, the legendary former Liverpool manager. But they would probably have appreciated his most famous quote: "Some people believe football is a matter of life and death. I am very disappointed with that attitude. I can assure you it is much, much more important than that."